The primary colors for UW-Extension Continuing Education, Outreach, and E-Learning are Black, Pantone 293 (blue) , Pantone 215* (red), Pantone Cool Gray 9c** (gray) and Pantone 5493 (light blue)***. Additional colors of Pantone 7625** (orange) and Pantone 7701** (dark blue). **Orange, Dark Blue, and Gray are standard colors in all collaborative program identities. ****Websites use #444444 gray for text and other consistent applications. Secondary color palettes (brights, softs, and jewel tones) are available for download through the links at the left. These color palettes can be used individually but are also designed to work with colors from other palettes. An additional alternate brand colors palette consisting of a brights palette, exists for additional color selection for programs such as UW FLEX. 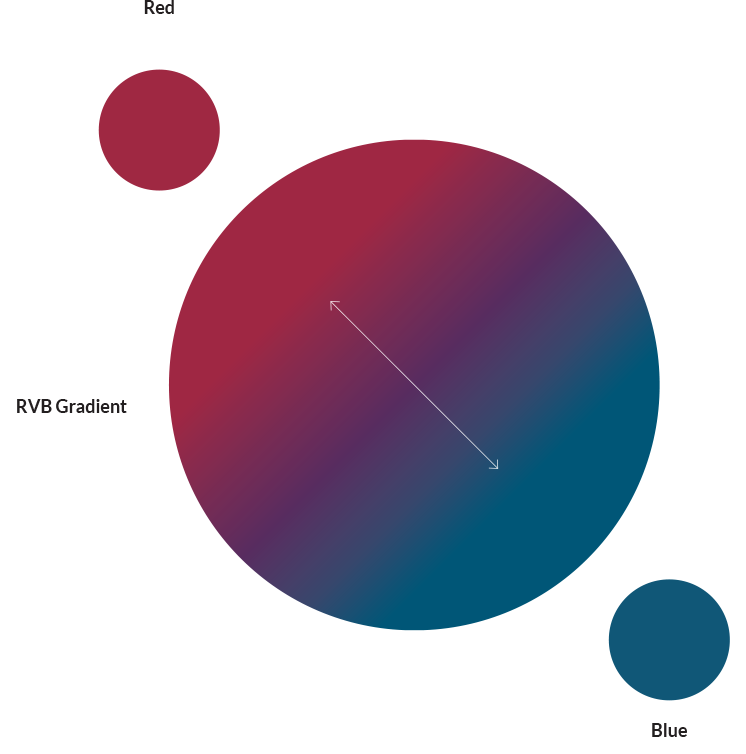 The RVB gradient is comprised of the red and blue to create a vibrant gradient or glow. The red always appear to come from the top left corner at a 45 degree angle.